Speaking to Elk Grove's smart-growth advocacy organization Elk Grove GRASP last night, a leading commercial agriculture authority reminisced about the city's proud agricultural heritage and said it could have a bright future in that segment if the city has the will to seize those economic development opportunities. 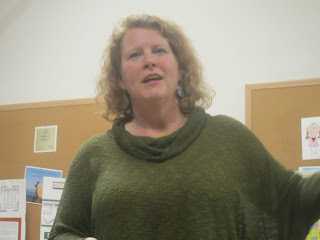 Speaking to the group was Mary Kimball, Executive Director of Winters Calif.-based Center For Land-Based Learning (CFLBL). The non-profit group is dedicated to helping develop the next generation of farmers and educating California youth on the importance of resource conservation. Elk Grove could prosper if it seizes agricultural opportunities. During her hour-long-plus presentation, Kimball touched on numerous challenges and opportunities in the vast, but often overlooked agricultural segment of the American economy. Kimball stressed that even urban areas could develop successful commercial agricultural operations. Pointing to West Sacramento, Kimball noted the CFLBL helped that city develop numerous commercial-farming operations within the boundaries. The vacant parcels are leased to CFLBL and then leased back to the operators, are on lots as small as two-thirds of an acre. Aside from providing a launching pad for commercial farmers trained through their programs, urban farms also have societal benefits. The aforementioned two-third acre commercial operation is located in West Sacramento's economically challenged Broderick neighborhood that sells products directly to consumers in an area considered to be a so-called food desert. "It is not a community garden," Kimball stressed. "These are commercial operations, these are farmers who are trained, they are farmers that are vetted through our organization and then we are able to place them, support them, mentor them." The program at CFLBL to date has 80 graduates of their various training programs, 17 of which have moved on to purchase their property for a commercial operation. Born and raised in Woodland, Kimball said as a youth she was involved in Future Farmers of America while in high school and had found memories of Elk Grove. "To be honest with you, I have been fairly saddened by the changes I have seen in Elk Grove over the years," she said. Kimball noted that Yolo County has taken a "different tact" compared to Elk Grove and Sacramento County and that "92-percent of the people there live on three-percent of the land." "It has focused on growth within city limits and not expansion," she noted. Despite its explosive residential growth, Kimball said during a question and answer session that Elk Grove could be well positioned to seize opportunities given the burgeoning interest in locally sourced foods and beer brewing if it has the will. Noting hops are in demand with local brewers and that there use to be a thriving industry in the area, Kimball said Elk Grove could encourage the development of that cash crop in the city. Kimball noted brewers like to have locally sources supplies, and as part of the story for their products, telling the story of the area's rich hop history would be a major marketing advantage. "Everybody wants to buy local hops," Kimball said. "You guys have the tradition here, you have the story." Should hops be grown locally, Kimball said a malting facility would be a perfect ancillary business. Although an almost ancient process, it requires enormous amounts of space, which would be ideal for empty warehouses in the area. "If we could have a malting facility here, you would have the hops," she said. "Elk Grove with its 3,000 [undeveloped] acres, makes that an incredible economic benefit." Kimball also noted that it is crucial that residents let their voices be heard on how they want development to proceed in their communities. "Having the public give their feedback is so incredibly important," she said. "If they don't hear from you, they will make the decision in a vacuum, and it is really critical for the citizen to say what they want. " Of the 30-plus people in attendance were Elk Grove Councilman Steve Detrick, Planning Commissioner Kevin Spease and City of Elk Grove senior planner Christopher Jordan. After the meeting, noting Kimball's comments on citizen involvement, GRASP representative Lynn Wheat referenced the City of Elk Grove's planning for the new Southeast Policy Area (SEPA). During that process, several people urged the city to incorporate agricultural elements in the plan that could commercially leverage Elk Grove's agricultural heritage and the farm to fork movement. "She [Kimball] validated many residents' comments during the SEPA process that were ignored by the policy makers and the developers," Wheat said. Listen to the entire presentation below. Unless they do it in Roseville or Irvine, we ain't interested! Hey, Dan at EGN, didn't you write an article on this very subject years ago, copying people at the city of Elk Grove. We can ill afford any misopportunities to be on the cutting edge of new ventures, and lucrative ones at that, bringing money and jobs to Elk Grove. I checked your archives. Yes, you did. Here is the link to the article, and once again, as noted by a a previous commentator, please unlock the link. Thank you for posting the audio tape of Ms. Kimball's presentation. There were many things she brought to my attention, and although there are many significant portions, I would like to comment on one topic she touched on, and that concerns their work with Veterans. From what most of us already know, the needs of our Veterans returning from Iraq and Afghanistan are not surprisingly unique compared to prior combat veterans. While our city aspires to build a Veterans hall, I will submit the greater need is to dedicate resources, read money, to our younger Vets. Let's be honest - a Veterans Hall will be a nice gathering place, but will it help serve the needs of the young men and women who are returning to their families and community with PTSD? Will the younger Vets even use the facility? I realize the city does not have the statutory responsibility to help with the social needs of our Vets, but I might suggest the city explore partnering with the Center for Land-Based Learning and see if we can't get some of our Vets, whether they live in Elk Grove or not, interested in farming. Not only will it truly honor our commitment to Vets and help them readjust to their life here, but they could be just the type of motivated men and woman an Elk Grove business incubator needs to prime the pump of economic development. This Farm to Fork stuff is cra*. Region Builders, who owns Elk Grove, says Dirt to Cash is where it's at! End of story. As usual, the Captain is right on. We do need to take care of our vets better than we have to date. The VA has become a big joke. Want to become a destination city? Let's start with new, innovative and dedicated programs such as this to assist our vets. For a change, let's do what's right, not for the money, but just because. I'll wait to see how our electeds and candidates act on this concept. A Malt factory? Are you kidding me? That means Elk Grove can become the Malted Milk Shake capitol of the world!